The Dulit Frogmouth, Batrachostomus harterti is an extremely rare bird sought after by many bird-watchers and currently, not much is known about its behavior. A submontain species belonging to the family ‘Podargidae’, Dulit Frogmouths are curious-looking, intriguing nocturnal birds related to the nightjars, but are however adapted to live inside the forest. These birds were found in a few remote mountains of Sarawak south to Mt Liang Kubung in West Kalimantan. We flew over mountains and cruised across rivers deep in the heart of Borneo’s tropical rainforest in our quest for this elusive bird. To date, only 7 known specimens of the skin have been collected in natural history museums between the years of 1950 to 1958. Reliable sources state that fewer than 5 people have actually witnessed the rare sight of the Dulit Frogmouth in its natural environment. Indeed, by sheer chance, in the midst of our arduous night staking out in the Borneo rainforest, we might have very well been the first to photograph the rare Dulit Frogmouth in the wild on night of 24 April 2009, during our photography expedition to Sarawak, Malaysian Borneo. The frogmouth repeatedly called with a single clear whistle. Was this the Dulit Frogmouth? Since not much is known about the bird, it was extremely difficult to identify the bird for sure. 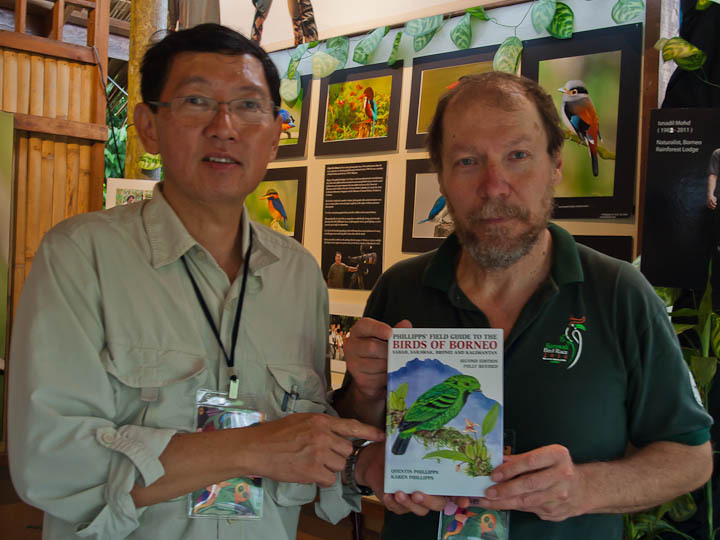 We have checked with a few prominent Borneo bird experts in Asia and UK. The decisions were divided. To solve the mystery, we went back to the Sarawak Natural History Museum to compare the difference between the Dulit and the Large Frogmouth. Judging from the image and the skins, it was extremely difficult to differentiate the two as there were so much variation in the plumage of the frogmouths. Since the bird was photographed at an elevation of around 1000m above the sea level, it is most likely that it was the Dulit Frogmouth as the Large Frogmouth is known to be a low elevation bird. Opinions were divided until in October 2010 when the Forktail Journal of Asian Ornithology, Issue 26, September 2010 published an article on the “ The Song of the Dulit Frogmouth “ by Dennis Yong and Ben King. In the article, Dennis Yong and Ben King stated that ” The frogmouth was identified by a combination of size, voice, altitude and locality”. The call, altitude and locality matched the description. Therefore, the image shown here is very highly likely to be of the rare Dulit Frogmouth rather than the Large Frogmouth of Borneo. Special thanks to Quentin Phillips who actively linked me to various people around the world to confirm the Dulit Frogmouth. Anthony Wong and Yeo Siew Teck from MNS in Kuching Sarawak who assisted us in the investigation of the frogmouth at the Natural History Museum. Tags: Photography workshop borneo, Rare birds of Borneo. Bookmark the permalink. Congrats on the extremely rare find, John. Hi TS, It took me a a while to put up the story since I last met you. All the best to your birding.